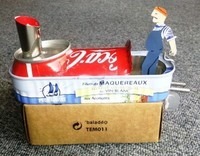 We have kits available to construct and add real steam power. Small and large pop pop engines engines are also available. Add to your own project. 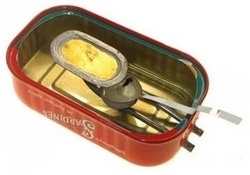 Our first attempt took just 10 minutes - a Sardine tin, a drill and some Araldite to seal the holes. It runs really well on both candles and Olive oil. What's next? (more pictures below). 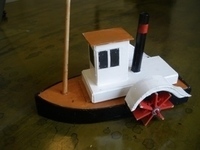 A well made tug boat using all the latest materials and a large pop pop engine. Very Noisy!! Powered by a tea light. 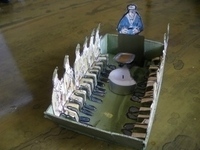 A Selection of Boats from Bill using a Pop Pop Boat engine and some imagination. 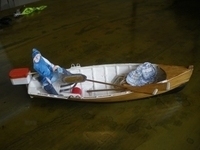 "Here are three boats I have knocked up. 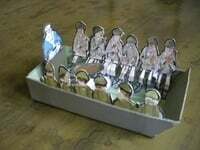 They are a bit crude in places because I wanted an instant playtime rather than a museum quality exhibit"
"The first one is based on a clinker dinghy similar to those you can buy as holiday souvenirs. 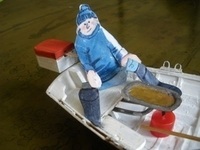 Dan, Dan the Fisherman and the lobster pots were painted on stiffish card, cut out and varnished"